RHC Polished Metal Sand Timer, Size/dimension: 6"
With highly driven excellence in handicraft field, we have come up with a wide range of uniquely developed and deigned Metal Sand Timer to our customers. The offered product is designed and developed under the supervision of highly skilled and experienced artisans, who make use of latest technique. 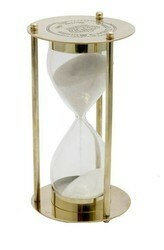 Our offered sand timers provide precise time hours and minutes in which esteemed customers can choose from. 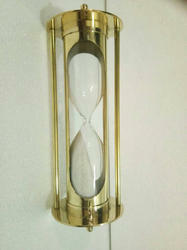 Our personalized brass/wood Sand Timer would make a great gift for a loved one, friend, or co-worker for just about any occasion. Each Sand Timer is hand crafted in a vintage style similar to Sand Timer produced by a famous British manufacturer, Stanley London, at the turn of the 19th century.